Product #3076 | SKU 1450-406-100 | 0.0 (no ratings yet) Thanks for your rating! 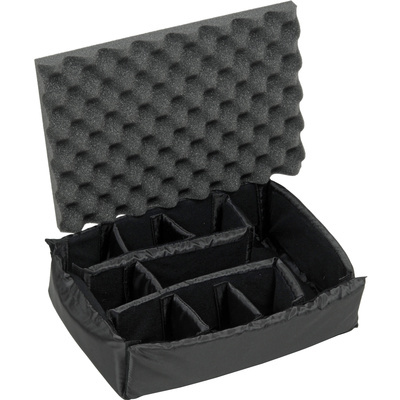 The Pelican 1455 Padded Divider Set is a 8 piece set made to organise small and large items. The dividers are made from ballistic nylon and are padded and flexible. They have Touch Fastener on the edges that are used to attach the dividers to the tray or other dividers. This case is a replacement for the Pelican 1454 series cases and an accessory for the Pelican 1450 series cases. Ballistic nylon padded and flexible divider set with Touch Fastener closure. 8 piece padded divider set consisting of 1 tray, 2 structural dividers and 5 padded and flexible dividers. 1 Top lid foam section is included.